Robbin started working for the ACME Click store in Ellet a few days after we graduated, and spent 20 years working there. 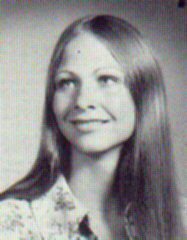 She married Mark Kiltau, (Ellet class of '73), on April 26th, 1975, and they have two daughters. First, there is Andrea, who is 29. She lives in Iowa, and works for Wells Fargo Financial. She's been gone almost 4 years, is not married and has no kids yet. Their second daughter is Lindsey, who is 27. She has 2 kids: a boy, Riley Andrew, who will be 6, in February. Riley started kindergarten this fall, and Robbin picks him up everyday after school. Lindsey also has a girl, Reese Alizabeth, who will be 4, in June. In 1994, Mark got a job in Georgia, so they left Akron. In 1996, Mark's company transferred him and they moved to Tennessee. They have been in Knoxville for the last twelve years. She said that when they moved to Tennessee, she worked for 'Natural Wonders', a nature store: rocks, minerals, toys, etc. for almost 3 years, and had they not gone out of business, "I think I would still be there, as I loved it!" Robbin was really into gardening but that got stopped about 3 yrs. ago, when she found out she had skin lupus, It feeds off of the sun, so she has to stay out of it. "I try not to let it get me down, but there are days when the brain's going 50 miles an hour, but the body's not." But she says, "I am still pretty much a go-with-the-flow kinda girl."